Another great weekend for soccer. The girls were placed in the Bronze division along with two other Buckeye opponents. The girls went undefeated through their bracket with a 2-0 win over WC United White, 6-1 over a CU team and a 4-1 win over Warrior White. In the finals the girls played a NKSA team and finshed undefeated with a 4-1 win. Another beautiful fall weekend for soccer. The team participated in the BSA Haunted Classic and went 4-0 and only gave up 1 goal the entire weekend. What a fantastic weekend team storm had while participating in the 2011 Middletown Spring Blast. The weather decided to stay nice and the fields were in great shape for an early spring tournament. The team only practiced twice under the direction of Coach Fern (Ron), but came ready to play. Our first game was against a good Thunder United team and the girls started off a little slow resulting in a half time score of 1-0. However, the girls stepped it up in the second half and scored 3 goals within the first 4 minutes of the half. One highlight, Emma B. got her first header off a corner for a goal. They completed the game with a final of 5-0. Our second game Saturday was aginst Michigan Legacy. This game was odd for us, we played between the 18s, but allowed 2 goals in the first half. The girls came out strong in the second half and played mostly on our opponents side of the field. As a result of their strong effort, team Storm answered the call by scoring 3 unanswered goals to close out Saturday with a win. Sunday's morning game was against an old league opponent, the Cincinnati West Bulldogs. Storm played very good for both halfs and put the game away with a win. In the final game, we were matched again, against the CW Bulldogs and we came ready to play. The girls played outstanding and went on to win 4-0. One highlight worth mentioning, Katie scored off a corner kick with no help. Congrats to the girls and a big welcome to our newest member Isa. It was a very fun filled and exciting weekend for the Middletown Storm girls. We traveled to Columbus to participate in the 2010 COSA Fall Classic tournament. It was our final tournament of the year and somewhat different. We played "up" in the U13 bracket for the first time, had a guest player (Dee our goalie) and only two subs. The girls had about a half hour introduction to the 11v11 format just prior to the tournament. They came out strong, winning their first game against Oakwood United and their second against River Valley Soccer Club from West Virginia. The day was concluded with a scavenger hunt at the hotel for the girls and siblings. On Sunday, the girls played a tough Michigan Alliance team to a 2-1 win to secure a place in the finals. After waiting a few hours the final game was played just prior to sunset. Team Storm, scored the first and only goal late in the first half off of a penalty kick just insided the midfield line. Katie struck a perfect shot and our forwards made an oustanding run from just outside the 18. The run was timed so well that their goalie seemed flustered and the ball slipped through her hands. On a final note, the girls played & made the finals in all three tournaments this fall. Congrats on another tournament win and many thanks to Dee for her participation. Also, thanks to the team & parents for a successful season. 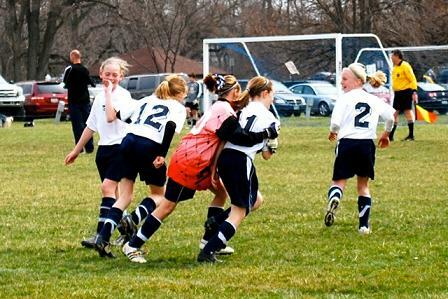 The U12 Middletown Storm girls competed in the 2010 CSA Dog Days of Summer tournament as a preseason warmup. As with most August tournaments, the weather was hot and dry. The girls were slotted in the Gold division with two local teams and a top ranked Indiana team. Although the girls didn't play their best on Saturday, they played the WC and TFA team to a win and a tie. Their next in bracket opponent was FC Pride Elite from Indiana. FC won both games on Saturday so a win by us was a must to advance. The girls played much better Sunday morning and advanced to the finals with a 2-1 win over FC Pride. In the finals against CSA Elite the girls played to a tie in the first half, but ran out of gas in the second half. Congrats to the girls for being a finalist.... and a big welcome to Sammy C, our newest member. Again this year, team Storm participated in our club tournament the Middletown Spring Blast. As with most spring preseaon tournaments, the weather is always questionable. For 2010 the weather was on our side, no snow or rain. Our day began with a win midmorning Saturday against JYSA Orange, a premier team from Kentucky. Team storm started off a little slow and continued this into their afternoon game against WC white which resulted in a 0-0 tie. As individuals they worked hard and were successful, but they could not get in-sync with each other. This improved greatly on Sunday. Their first Sunday win came against an FC Phoenix team from Columbus, as a result this put them into the finals against WC White. The championship game started with a typical spring wind and some overcast skies. A very good WC White team took the lead around the 15 minute mark with a nice cross and tap in. However, team storm answered when a defender took the ball nearly the length of the field and scored from just outside the 18. The first half battle ended with a 1-1 tie. In the second half the game became ours. We started controlling the ball better and allowing our forwards to take more shots. As a result, we scored 2 unaswered goals to go on to a 3-1 win. Congrats to the girls and a big welcome to our newest player Emma B.. The Midfest tournament was played the weekend of Sept 26th. The girls were placed in the top division along with several other good quality teams. As for the weather, the fields were saturated from week long rains and the skies remained cloudy for most of the tournament. To begin the tournament, the Storm girls played two Warrior classic teams on Saturday with outstanding results. Everyone played well, however an ESPN moment occured during the second game when our newest member Samantha pulled off a beautiful rainbow just past midfield. With a new day,Sunday, came new games. Our first game against a league opponent, CW Bulldogs, was very exciting. The girls started out strong in the first half but could not find the back of the net. On the flip side, our defense did not allow a single shot in the first half. As the second half began, team storm stepped it up. They scored two unanswered goals and went on to win 2-0. The bulldogs had one nice shot in the second half, but it was thwarted by an excellent diving catch by Jamie. In the finals, Storm played WFC Lightning for the championship. This was the third meeting of these teams and the girls played to another win. Throughout the tournament, the girls displayed their talents with moves and great decision making. 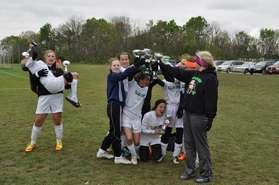 The Storm girls finished their 2009 spring season with an undefeated march through the TSCSL end of season tournament. It took two weekends and 5 games to complete, but the girls took home another first place. Although the team scored around 16 goals and allowed only 2, our team favorite was our first corner/header goal scored during the second game. The Storm team was bracketed in the the top division (red) for the 2009 Spring Blast. It was a beautiful weekend for soccer, as the clouds gave way to sun by mid afternoon on Saturday for the remainder of the tournament. As many preseason tournaments go, we only had a couple of practices prior to this weekend, however the girls didn't miss a beat. They won their bracket with two in-brackets wins and one cross over win. Their two wins Saturday were against a good Toledo club and their second team. Sunday wins proved to be a little more difficult, as we were missing two players. The first win Sunday was against a premier BSA Celtics team that fought hard until team Storm put the game away with three goals in the final 15 minutes of play. The championship game was against an in-club team, the Mustangs, who proved very tough. In the end, the girls worked hard to bring home another tournament championship. The Storm girls participated in the TSCSL end of season tournament and were bracketed in the Gold division. The gold division was composed of 12 teams from the premier, comp1 and some comp2 teams. With an early loss in round 2, the girls had to win all remaining games (5) to make it into the finals. After a hard fought battle for the championship, the girls finished second. Congrats to all the girls on an exicting finish for the Fall 2008 season. They played fantastic soccer, and as always, entertained their fans and opponents. Team Storm continued to build on their success from their U9 season(s). They finished runner up in the Fall 2008 U10 Premier division in our new league (Tristate Club Soccer). The team played in two tournaments including the preseason Mead Cup and the Cincy Challenge Cup. Although they didn’t have the opportunity to play in the finals in either tournament, they showed us how talented they are. In both tournaments, the winner of the division came from our bracket and easily won the tournament. Both tournaments provided the girls great competition, as all teams played were either Premier or Comp 1. In the end, the girls finished 2-1 in each tournament with a goal differential of +9. As in the past, the girls continued to improve on ball handling skills (main goal). Although every player scored a goal, the girls continued to entertain the parents, grandparents and friends throughout the season. Although the girls had a slow start in their first game, again team Storm entertained their parents with creative soccer skills and decisive wins in the remaining three games. Field conditions for their first game were extremly poor, as a quarter of the field had standing water and the grass was long. However, as the weekend progressed, the field conditions greatly improved allowing the girls to use their creativity, skills and love of the game to complete another successfull tournament. The final result, they went undefeated and brought home a 1st place. The girls went undefeated throughout their bracket to win the Arsenal Challenge Cup silver division. Congrats to the girls for their win and creative soccer moves performed during every game.